Tickets are £1 each and available in a book of 10.
or by calling our Capital Appeal Team on 01236 772048. We are excited to launch our 2019 calendar featuring artwork by Scottish painter Gerard M. Burns. Proceeds from the sale of this calendar will go towards the St Andrew’s Hospice Capital Appeal. A4 and A3 calendars available. 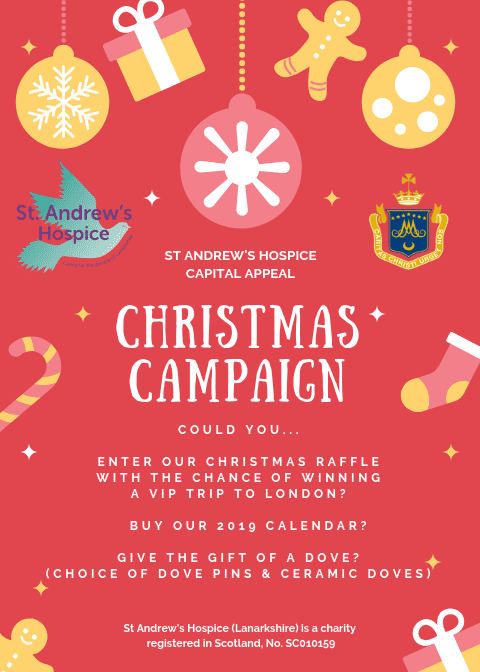 Giving the Gift of a Dove to family and friends is a great way to celebrate a variety of life events; such as Christmas, anniversaries, birthdays, christenings or to simply make a donation to our Appeal. The dove is synonymous with the hospice and symbolises your donation. Click here to Give the Gift of a Dove today.